Travel back to 1938, to a glacier-carved valley deep in the heart of Wrangell-St. Elias National Park. 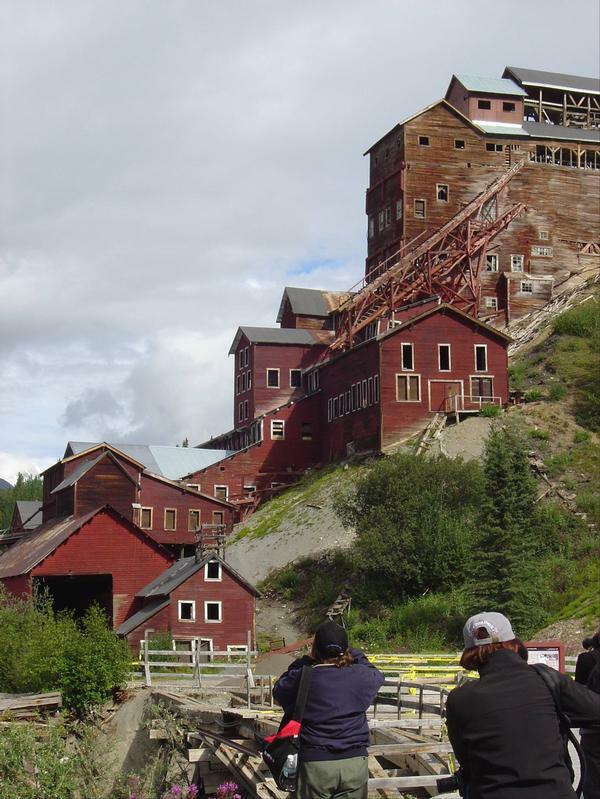 Kennicott is a classic mining town, with life revolving around company operations and the nearby town of McCarthy booming with restaurants, pool halls, hotels, saloons and a thriving red light district. A train pulls up to the Kennicott depot and some 600 employees of the Kennecott Copper Corporation scramble to reach the doors of the train, clinging to what belongings they could carry and abandoning the rest. Why the rush you ask? This will be the last train out of Kennicott. In the 27 years since copper ore was first discovered in the mountains near Kennicott, a staggering $200 million in copper was harvested, some of the richest deposits ever found in the world. In 1938, when the mines had been depleted, the Kennecott Copper Corporation and the railroad would cease operation, leaving behind a ghost town of bright red mine buildings that cling to the steep, rocky cliffs. Traveling there today paints a vivid portrait of life when Kennicott was a booming town that grew virtually overnight, and disappeared even faster. The Copper River Princess Wilderness Lodge is the perfect base camp for this adventure, located about five hours east of Anchorage at milepost 102 of the Richardson Highway and about 2.5 hours from Valdez. The journey to Kennicott and McCarthy begins with a three-hour drive along the gravel McCarthy Road. There’s time to explore the town of McCarthy and have lunch before continuing on to Kennicott. Here you’ll take a guided tour of the 14-story mill building, with much of the original equipment still intact (not including the elevator so be prepared for some steep staircases). One of the quirkiest tidbits you’ll learn is that the mining company took its name from the Kennicott Glacier, but misspelled it. Therefore, while the company is named the Kennecott Mining Co., the correct spelling of the town and the glacier remains “Kennicott.” The return to the Princess Lodge is via Alaska bush plane, with a narrated flightseeing tour above the glaciers, mountain peaks and wildlife that inhabit the nation’s largest national park. While you may have visited a mining town or two before, what sets this place apart is that it was copper ore that drove prospectors to Kennicott, and that so much of it has been preserved in its original state. It’s a trip back in time you may not have even known was here — like nowhere else in Alaska — and there’s no better time than the present. The Copper River Princess Wilderness Lodge will be open this summer from June 3 – Aug. 31. Residents can take advantage of shoulder-seasons to avoid the crowds and reap some great discounts, make sure you check out the current specials.